Today, we celebrated the ordination of Rev. David Nakmoo Jun at ICC. 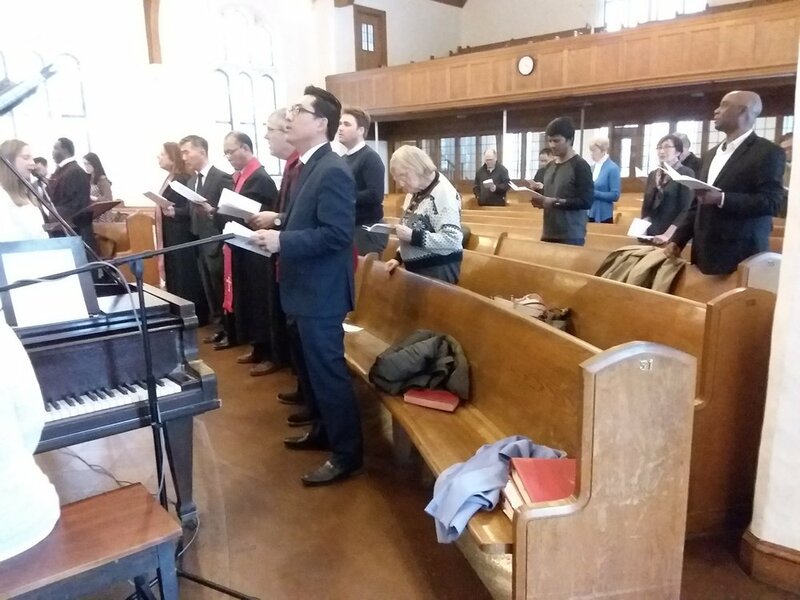 A native of Chungnam Nonsan, Korea, David has been assisting with the ministry at ICC for many years, and also pastors a small Korean-language congregation, Allston Korean Church. David’s candidacy was approved by a vote of the Samuel Stillman Association of the American Baptist Churches of Massachusetts (TABCOM) in January. Today, TABCOM Executive Minister Mary Day Miller presented David with a certificate documenting his ordination by the denomination. Many Stillman Association clergy were present for today’s service, which included a sermon by Rev. Jon Hevelone of the First Baptist Church of Arlington. David Nakmoo Jun received his ordination certificate from Mary Day Miller, executive minister of TABCOM. Many clergy from the Samuel Stillman Association were among those in attendance at the ordination service. What would a Baptist gathering be without food? After the service, we enjoyed a variety of Korean dishes prepared by David’s wife Ellen Haekyung Jun. Judy Kee will be traveling to the Democratic Republic of Congo from February 7 through 26. Her prayer supporters will be pondering the same Scripture each day. As I reflect on the events that happened in Charlottesville, Virginia, I am saddened by the radical exhibit of deep-seated, sinful hatred that was so viciously displayed and caused the death of a young woman who was a supporter of social equality and promoted anti-racism. We all know that racism has always been a part of the legacy of America, and it started long before the theft and enslavement of Africans. Hate groups such as the KKK, neo-Nazis, and “alt-right” nationalists promote ethnic cleansing and the annihilation of human beings. Fear and loathing of marginalized people, along with the negative portrait of certain culturally ethnic communities, are major tools of oppression, and this lays a foundation that becomes a breeding ground for the ideology of white supremacy. These people do not know God because they walk in darkness. If they knew God, they would know that there is no master race; there is no superior race; there is only the human race. God created it and the only one that is superior in this entire universe is Him. Although my heart hurts because of Charlottesville and the casualties that happened there, I find myself saying that the entire United States of America has been awakened by the political and social alarm of racism and white supremacy. Americans have wiped the scales from their eyes and are no longer blind to the realities of bigotry. The voice of Americans is being heard, and it is shouting loud and clear: not again! Hate can no longer be tolerated, and we will stand strong against those who live in the dark world of human oppression, discrimination, and racial inferiority. As an Alabamian who saw the civil rights movement up close, I cried a heartfelt cry that we are here again. As a pastor, I prayed long and hard for our people, our country, and asked Christ to give me the strength to stand and not waver in these dark, turbulent times. God did not give us a spirit of fear, but of power and of love and of sound judgment. So, here I stand, yet again, in the sacrificial love of Jesus Christ and the biblical sword of truth in my hand, with prayer in my heart and a voice that speaks out against the dark cowardice voice of racism. We're collecting clothing to help re-stock the clothing exchange at Brighton Congregational Church. Business attire is especially helpful to people who need to look their best for a job interview. We've got 4 bags - please help us get to 10! The Week of Prayer for Christian Unity is an international initiative where Christians worldwide are reminded of Jesus’ prayer for his disciples that “they may be one so that the world may believe” (John 17:21). Locally, UniteBoston is coordinating seven consecutive evening gatherings of prayer and worship from January 18-25. On the occasion of the 500th anniversary year of the beginnings of the Reformation, the theme “Reconciliation – The Love of Christ Compels Us” (2 Corinthians 5:14-20) has been chosen by the World Council of Churches. Here is a schedule of local gatherings. Please join in as you are able! ICC will be part of Operation Christmas Child this year, preparing shoeboxes filled with gifts that will be distributed to children in more than 100 countries, where they will be distributed by pastors and community leaders who want to share the gospel and bless children. The ICC community will prepare shoeboxes and will also serve as a drop-off location for others in the community who want to participate. Here are some suggestions for preparing a box. Start with a medium to large item that will capture the child’s attention the instant he or she opens the box. Ideas include: soccer ball with pump, stuffed animal, toys (puppets, trucks, etc. ), doll, musical instrument, outfit, or shoes. The woman in Luke 7 is the subject of a recent sermon by Pastor Doris. "How did she get in here? What's going on between her and Jesus?" This excerpt features music added by Rafael Chavante. When you dedicated your life to Christ, spiritual warfare starts and the attacks are nonstop. These attacks are designed to make us feel powerless and out of control. Defeat and failure become our outlook on life. Satan catches you when you are unaware, when you are vulnerable, when you have doubt. I want you to have unshakable faith—and I want you to understand that, even through you may experience failures in your lives, you are not a casualty of war. That’s because the battle is not yours—it’s the Lord’s. I don’t want you to begin to think that God is not with you. He has not left you powerless and unprotected. God has left you with power and has given you his protection. He has given you the armor you need to protect you from the forces of evil and hatred.